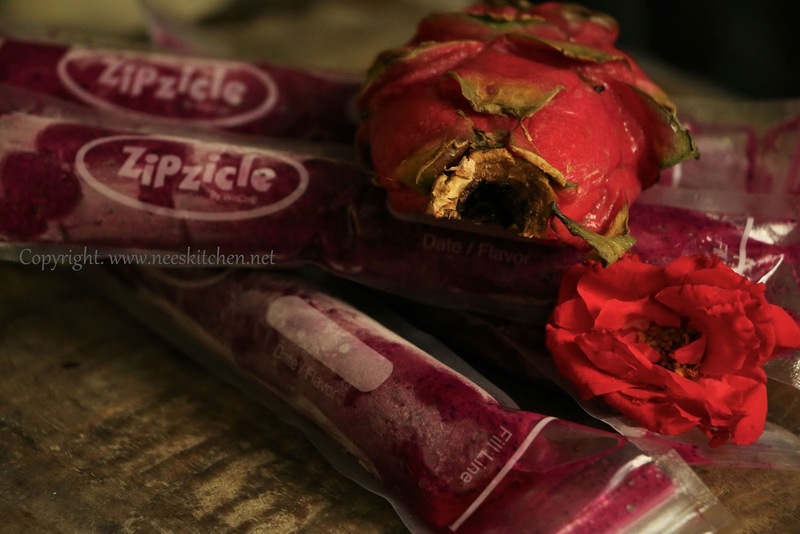 Dragon fruit rose popsicle is a great way to incorporate dragon fruit into your diet. The sweetness is perfect and the fruit is loaded with fiber & anti-oxidants and they are definitely a part of our regular diet whenever they are available in the market. The key to Dragon fruit rose Popsicle lies in the sweetness of the dragon fruit. . We need to use the pink flesh dragon fruit and not the white ones. This red skin, green scales, pink pulp and black seeds is sweet naturally when comparing the white pulp which is bland. From the external appearance there is no difference, however the shape of the red flesh dragon fruit is round while the white ones are oval. The seeds inside the fruit cannot be thrown and must be chewed very nicely to get the maximum benefits. They give a natural nutty taste & color when added in any dishes. There is minimal use of palm sugar and rose water as they provide the sweetness and aroma to this Dragon fruit rose Popsicle. 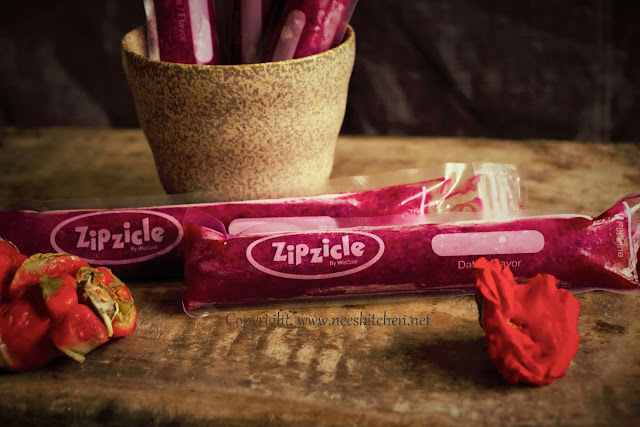 Each pack of zipzicle has 36 ice pops bags measuring 5x23cm. You can check the website or write to them on product availability based on your location. 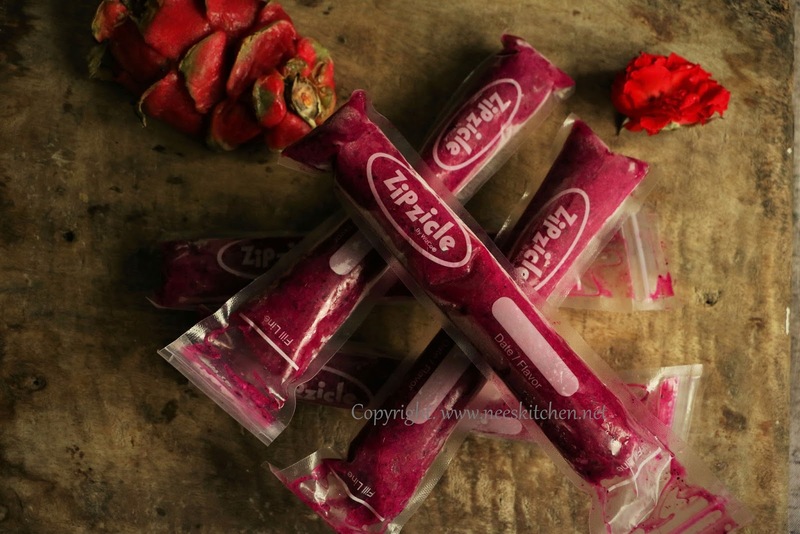 Zipzicle – Check out the website for product availability. 1. To begin making the Dragon Fruit Rose Popscile, slit the dragon fruit skin and take out the pulp. Refer video. 2. Chop the pulp into big chunks. 3. Take a large bowl and add the chopped dragon fruit, rose water , water & sugar. 4. Pure the above mixture to a smooth puree in a blender. Remove to a bowl and set aside. 5. Take popsicle moulds/covers and pour the puree into them. You may use a funnel or syringe to pour them into zipzicles mould. 6. Freeze for a minimum of 6 hours or overnight and allow it to set in the moulds. 7. Once the ice pops are set, if you are using a popsicle mould place them in warm water or you may use your hand to make it warm to take out from the mould easily. Alternatively, if you are using zipszicle pouches you can start to consume them directly. 1. Adjust the taste of palm sugar as the taste of pitaya varies from variety to variety. 2. After blending you might need to adjust the sweetness taste as the seeds would have crushed by now and the sweetness might have reduced. 3. The seeds cannot 100% crush even if you blend for 6 minutes. It is still fine as the seeds give a natural crunchiness. 1. Chop the dragon fruit after removing its outer skin. 2. Take a mixie add dragon fruit, rose water and honey. 3. Blend well for a minimum of 6 minutes so that the seeds would get crushed well. Check the sweetness of the juice and add extra honey if needed. 4. Take a popsicle bag and a syringe or a funnel. Pour the juice into the popsicle bag. I used syringe as a fun activity with my kid. You may use funnel also. Adjust the taste of honey as the taste of pitaya varies from variety to variety. After blending you might need to adjust the sweetness taste as the seeds would have crushed by now and the sweetness might have reduced. The seeds cannot 100% crush even if you blend for 6 minutes. It is still fine as the seeds give a natural crunchiness.